The nest cup is deep, lined with grass and feathers, and located towards the back of the box. See photo below. 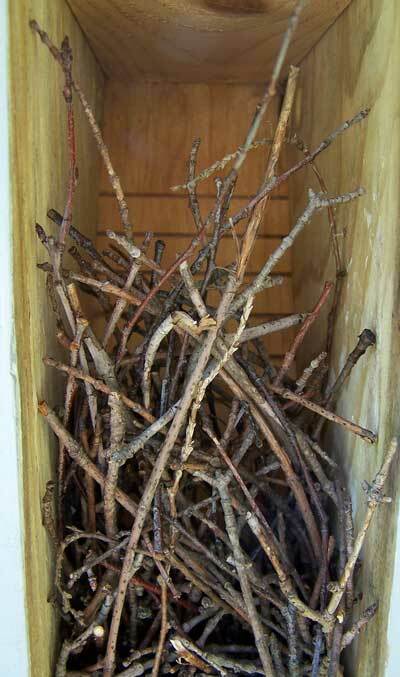 Nest description: Messy nest of coarse twigs (often with cottony spider cocoons), lined with fine fibers and downy feathers, usually filling box. 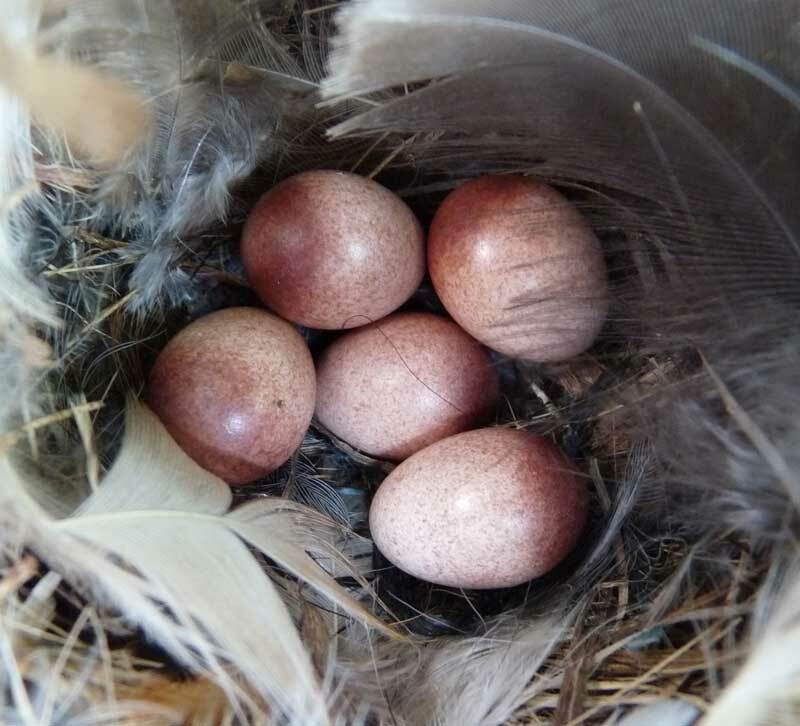 Eggs: Tiny glossy white eggs, often tinted pink/buff, with numerous pinkish brown/reddish brown/brown specks that generally form a ring on the larger end of the egg. Unless otherwise noted, photos by Bet Zimmerman. 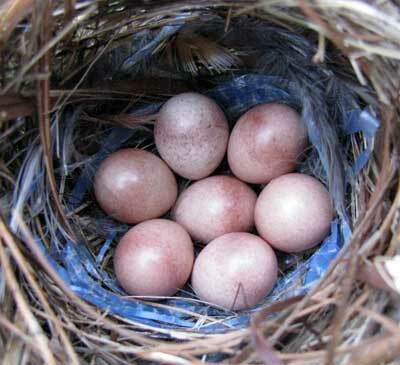 House Wren nest cup with eggs. House Wrens typically have 5-8 eggs per clutch. 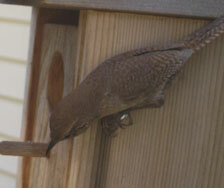 See more information under All About House Wrens (biology) Below, a House Wren brings a spider coccon into a nest. 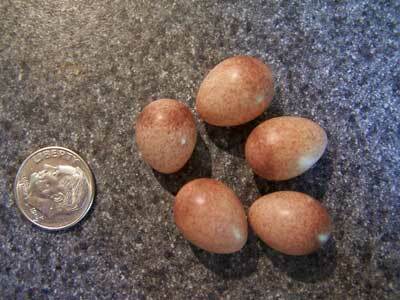 LEFT: House Wren eggs are typically somewhat glossy. They are more heavily spotted than those of Tufted Titmice, Chickadees or Carolina Wrens. BELOW: Entrance hole to box with HOWR nest. HOWR egg nest cup, lined with pieces of plastic tarp. (Eggs appear lighter than they really are in this photo.) The photo below (from a different nest) has more accurate color, and a stronger wreath that covers the entire large end of the egg. See higher res version. Photos by Bet Zimmerman. 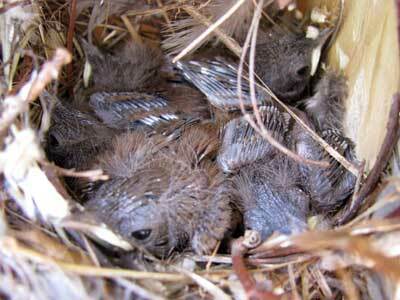 House Wren nestlings. Photo by Bet Zimmerman. Notice how pointy the beaks are. Color in this photo is not very good - babies are much more brown. House Wren nestling from nest shown above. Even when they are this young, they may try to prematurely fledge. HOWR nestlings. Photo by Bet Zimmerman. 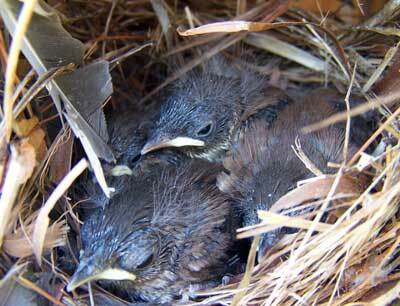 Nine day old House Wren chicks. Photo by Linda Moore. They look gray in the photo but are really more brownish. 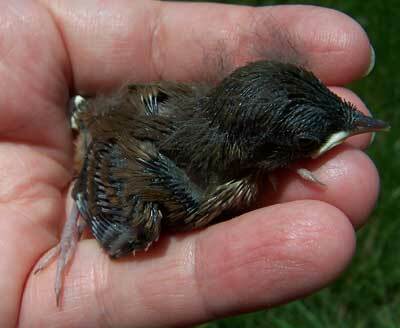 House Wrens nestlings are prone to premature fledging. 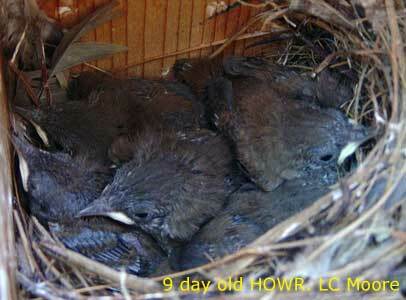 Normally they fledge 12 to 18 days after hatching, usually 16-18 days. 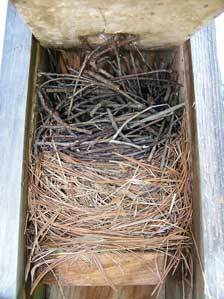 Males may build eggless "dummy nests" in nearby boxes to reduce competition. 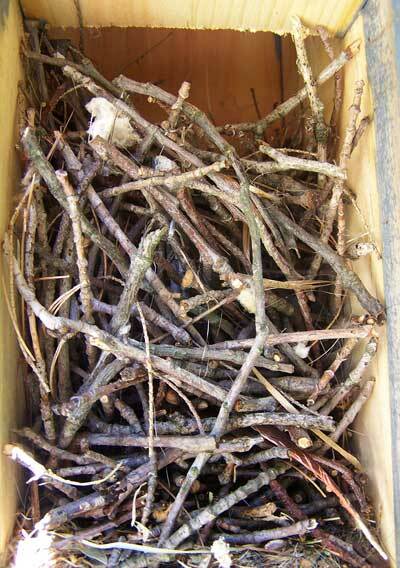 SOME dummy nests do not have spider cocoons. 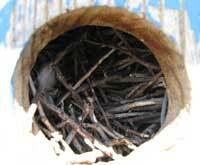 Removing these dummy nests (which lack a nest cup and eggs) is allowed. 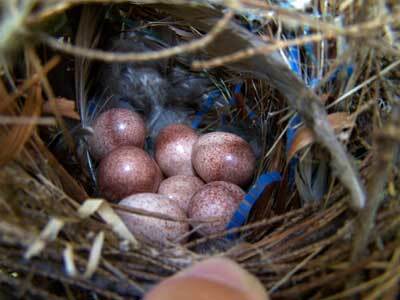 Since House Wrens are native birds, disturbing an active nest is not allowed. 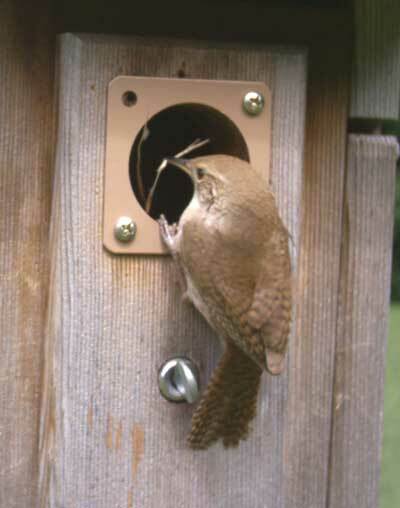 If you choose not to encourage House Wrens to nest in your boxes (since they will remove eggs and young of other birds) see tips on Deterring House Wrens. House Wrens are very territorial, and will put dummy nests or active nests on top of the nests of other birds, or they will remove the nests and eggs before building their own. To the left - a House Wren removing a Tree Swallow nest before building a dummy nest in the box. Below, A House Wren investigates a box occupied by a Chickadee. The bubbling music which springs so uncontrollably from his quivering throat is too characteristic a part of the season's chorus to be spared.